THE STORY - After a riding accident leaves him unable to compete on the rodeo circuit, a young cowboy searches for a new purpose. THE GOOD - Chloé Zhao tells a simple story in the most beautiful, humanistic and graceful manner imaginable, with real people and real emotion. THE BAD - Has very long stretches where not much happens and we're left wondering where the story is actually heading. 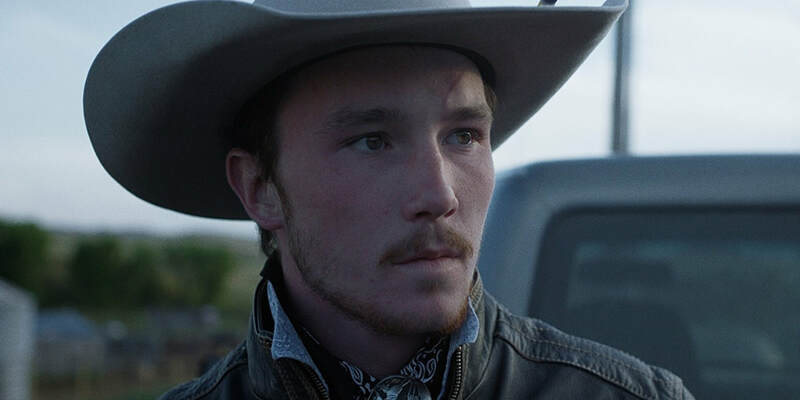 ​​In writer/director Chloé Zhao's independent film "The Rider," we get a snapshot of a young man's life through his family, friends, and passion. His purpose. However, we enter in at a unique time when this young man has come to a crossroad in his life where he is forced to make a decision which will impact the rest of his life. The film is very much about how to deal with the hands we are dealt in life, as one character tells our protagonist at one point. And Zhao's film handles that decision with grace, beauty and a humanistic eye for capturing the life-like emotion from her non-professional acting cast. A rodeo cowboy named Brady Blackburn (Brady Jandreau, making quite an impression in his on-screen debut) falls off his horse and receives a serious head injury which leaves him with a big scar, many staples and lingering effects over the rest of his body. Riding is this man's life. Growing up on a farm with his take-no-nonsense tough guy father (Played by Brady's real-life father Tim Jandreau) and his good-hearted sister (Lilly Jandreau), Brady's support system is certainly not strong enough to help him make this decision. His mom has recently passed away and his brother (Lane Scott) is in the hospital after sustaining an injury of his own. The decision of whether or not to give up on his passion and find a new purpose is his own. Brady Jandreau plays Brady Blackburn in "The Rider" and for a young man with zero acting experience, he manages to hold our attention on screen better than any of the non-professional actors in "The 15:17 To Paris" were able to do so. Now, this either because he is truly a natural on-screen presence or Chloé Zhao is a miracle worker. The answer could very well be both, for there is a nuanced performance given by Brady in this film which manages to captivate us throughout, even when the story itself starts to lose a bit of focus and stumbles a bit in the middle. The other non-professional actors and actresses don't manage to make as large of an impression as Brady does and much of that can be attributed to the film's focus on him. From the very beginning, until the end, we are left wondering what Brady will decide to do. The answer seems easy: give up riding forever and make the decision to live. We see the negative effects riding has had on his once indestructible brother who he looked up to. However, life is never that easy. This is Brady's passion. It is the reason he feels he was put on this earth. There is a scene where one of his friends is singing a song around a campfire and sings the words "I'm a gambling man." That gamble which Brady wrestles with, whether or not to ride again, is where the drama comes from for "The Rider." This is no better highlighted than in the scene where Brady shows us his skill at taming wild horses. We are constantly left wondering if he will make a mistake, or if his still nagging injury will cause an unfortunate accident which will permanently end his life. The tension is mixed, with beauty and tenderness in a manner which is all the more remarkable when you consider the real-life ramifications at play when shooting such an unpredictable scene. "The Rider" is a strong independent feature from writer/director Chloé Zhao that features some truly breathtaking shots of the modern western landscape and an even more breathtaking examination of one man's life and his decision of whether or not to continue living it. While it does at times feel a bit wandering in its middle section, Chloé Zhao keeps us guessing until the end which decision Brady is ultimately going to choose. It's very simple storytelling, told on the most elegant and complex scale imaginable, from the point of view of one person who has been dealt a bad hand and has to decide whether to continue playing and lose or fold and walk away. After the seeing the reception this film has received, I could not be more excited to see where Zhao takes her supremely gifted talents next.